Ottawa's East-West Bikeway has been talked about for a long time David Reevely penned a fine piece describing the plans at the end of October, 2011. Even then only "substantial completion" was promised for Fall 2014. 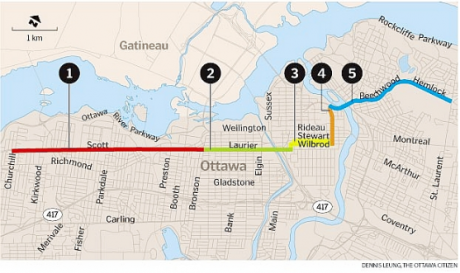 At first blush three years to substantially complete a 12 km Bikeway through Ottawa seems reasonable. Except of course the plan isn't to complete 12 km of bikeway, it is to link up nearly 12 km of bike routes. "Substantial completion" was really already there in 2011 two years prior to construction even starting. Here is a link to the Project PDF, a lot of existing/ improved route, less new. Connecting links is really important, All efforts to connect the disjointed cycling facilities in Ottawa should be cause for applause. Yet, here I am complaining about exactly such a plan. Why? This project represents $5 million dollars, nearly a fifth of the 10 year cycling budget. Or put another way two years of planned spending, illustrating the inadequacy of the over all budget. A fifth of the over all bike budget for what is really a modest and uninspiring project. A large section of which will be soon under buses until 2017, at least. As LRT construction forces buses out of the TransitWay trench. By far my biggest complaint is that this proposed route fails in the main goal, connecting the two neighbourhoods Westboro and Vanier. While, also avoiding many of the most interesting neighbourhoods in between. The main commercial street in Westboro is Richmond Road. Primarily between Golden and Kirkwood. Vanier's heart is Montreal Road. Scott and Churchill is at least close to where a cyclist travelling west across the city would likely want to go. The east end of the route is a different story, heading east just over a kilometre from goal, Vanier the route heads north crosses the Saint Patrick bridge and ends not in Vanier but New Edinburgh. Beechwood Avenue itself is a fine destination with some fine pubs and shops, it is also the last section to get any improvement, 2018+. An alternate route one block south on Barrette Street is suggested in the mean time, completely bypassing the destination street, though legitimately crossing into Vanier. I love that Ottawa is making the effort to join up its disjointed cycling infrastructure. Even if I'd rather that infrastructure were better, at least there is something. Ottawa is an awkward city to cross with several natural barriers an East West Bikeway is welcome but this plan is a lost opportunity. Rather respecting simple A-to-Bism this plan bypasses Hintenburg, Wellington West, the vibrant section of Laurier passing through Ottawa U and Sandy Hill. By-passing even, arguably, its terminus neighbourhoods of Westboro and Vanier. This is truly encapsulates everything wrong with Ottawa's cycling plans. Lots of talk, modest action and what action there is doesn't actually help people get where they want or need to go. Bikes are pushed out of neighbourhoods rather then invited in. The bike is transport as well as a leisure and commuter tool Ottawa needs to embrace all these functions. A comprehensive active transport plan can help up and coming neighbourhoods like Vanier and Wellington West as well as established neighbourhoods like Westboro and the Glebe. We just need to accept and invite the bike in.